For many people, a ringtone is an expression of their inner selves. When it comes to phone ringtones, the presets that come with your phone will only get you so far. You need a ringtone that shows your style and personality, and what better choice than a song you love? On the strength of the impressive 40 million-plus song catalog, each user of Spotify can find various pleasant songs that suit their taste with ease. But somewhat regrettably, the song from Spotify cannot be used as ringtone directly on account of music streaming's special protection, even it is downloaded with a Premium subscription. Most Spotify users expect to break the restriction and convert Spotify music to plain MP3 format so as to use Spotify songs as they want. Fortunately, there is a range of smart tools in the marketplace that helps you achieve the desire. In the following part, we're going to show you how to use Spotify song as phone ringtone by applying the most popular Spotify converting tool – TunePat Spotify Converter. TunePat Spotify Converter is an excellent music downloading and converting tool for Spotify. With this app, you can easily download any Spotify track, album, artist or playlist and convert to plain formats, such as MP3, AAC, FLAC, and WAV. With no need to install any extra apps, it's no doubt the fastest Spotify music converter that can work at 10X faster speed while converting. Furthermore, the program keeps lossless output quality after conversion. You can listen to your Spotify songs offline with original audio quality. 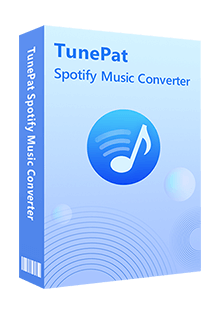 TunePat Spotify Converter is available on both Windows and Mac computers, here we take the Windows version as the example to show you the detailed steps about how to convert Spotify songs to MP3 format and set as ringtone. Once the conversion is done, you can find the downloaded Spotify songs by clicking the "History" button on the bottom right corner or directly going to the output folder you customized in previous step. Then you can download a free ringtone maker app to edit your MP3 files, turn them into custom ringtones and make it your default ringtone.